The Analog communication is a type of communication which deals with transmission of data signals which are considered as continuous wave signals. This tutorial gives a glimpse of knowledge on various types of modulation techniques that are useful in Analog Communication systems. By the end of this tutorial, the reader will be able to know the basic concepts that are involved in analog communication. 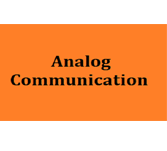 This tutorial is designed for beginners who are interested to know the basics of Analog communication and who wanted to acquire basic knowledge regarding Analog communication systems. A basic idea of knowledge about the basic concepts of communication is necessary to go through this tutorial. It will definitely help the students by the use of our tutorial Signals and Systems as a reference. A basic knowledge of the terms included in Electronics and Communications would be an added advantage.